If you are unable to find the answer to your question here, simply contact us utilizing our online contact form or call 734.418.0150 for additional assistance. Our friendly staff is available to answer your questions and assist you. To skip to a specific topic area, simply click on one of the following topics or continue to scroll down for the full FAQ. I have just placed my order online. What happens next? Within 24 hours, you will receive an e-mail confirmation from a member of our sales staff, including your attached full invoice. Please contact us via our online contact form or toll free at 888.961.0005 should you do not receive such confirmation via e-mail within 24 hours. You will then receive a confirmation of shipping e-mail from Fed Ex Ground or Freight once your order has shipped, including expected delivery date and full tracking information. We accept all major credit cards, including Visa, Mastercard, American Express, & Discover. You may enter your card information via our secure online ordering system, or call/fax this information to us. In the alternative, you are welcome to mail a personal or corporate check to our Southern California headquarters; however, please note this may result in a slight delay in the processing of your order. If you have any other questions regarding payment options, please contact us at 734.418.0150. Absolutely not. Please see our How to Order section for further details on ordering via the telephone, facsimile, or e-mail. What is included with Free Shipping? Is there a minimum order requirement? In an effort to keep the purchasing process as easy as possible for our clients, large & small, shipping for all items, regardless of size of order, is included in the purchase price. There are no hidden processing, handling or shipping fees that will pop up when you least expect it on your last check-out page of the web site or on your invoice. Unless we are shipping within the state of California (which necessitates the levying of state sales tax), you pay only the purchase price, which includes insured ground shipping to your door, including the delivery notification by the carrier detailed below. I need my order shipped outside the continental United Sates. Can you ship to me and, if so, what is the cost of shipping? Yes, we regularly ship to clients in Canada, Hawaii, Europe and other areas outside of the continental USA. We strive to make shipping as fast, efficient, and affordable for clients outside our free shipping area, and as such, are able to offer a simple shipping surcharge of 8% of the total order for shipments to Canada, Alaska, Hawaii, Puerto Rico, and the US Virgin Islands. These areas are serviced by Fed Ex Freight, assuring very fast service and a guaranteed delivery date. Other international destinations require the calculation of additional shipping cost on a case by case basis. Please feel free to contact us for a quote. Often it is the case that international clients have their own shipping arrangements, and we are happy to assist you if that is the case. With the vast majority of items in our catalog, we ship to you direct from our warehouse facilities in Southern California within a few business days of placing your order. At the very busiest times of year (namely late spring and summer), this process might be lengthened as we inspect and pack by hand each and every item being shipped. If an item is on back order, we will contact you upon receipt of order to verify the estimated shipping date. Shipping itself will take anywhere from 1 to 5 business days within the continental United States, depending upon your proximity to our location. If you require faster turnaround time or rush air shipping, please contact us directly for additional assistance in meeting your deadline. Do I need to be home to receive my furniture? No, you do not. Fed Ex Ground or Freight will contact you should they be unable to deliver without your signature or presence. Who is the shipping carrier for my order? Over the years we have found many common carriers for freight to be at best unreliable and at worst damaging to packages. After many trials and tribulations, we now employ the very best, most reliable service in the shipping industry, Fed Ex. Your order will be shipped via either Fed Ex Ground or Freight, depending on the dimensions of the packages, with a guaranteed delivery date. How do you keep your prices affordable compared to some of your competitors? This is our single most frequently asked question, particularly AFTER receipt of a client’s furniture order. Quite frankly, our extraordinary quality/value combination cannot be matched. Just how do we do it? All secrets revealed here in our About Us section. But the bottom line, plain and simple, is that we concentrate on quality and customer service, do things right the first time, and keep our overhead down by eschewing traditional methods of marketing such as printed mailings & catalogs in favor of concentrating on stylish, long-lasting quality teak furniture at prices that won’t break the bank. The result is lower pricing for our clients and sales in the form of referrals from happy, satisfied customers. Clients include some of the most exclusive resorts, restaurants, universities, & commercial facilities in the world. We do not strive to be the biggest teak company in the world. Simply, we strive to be the best. And to us, that means an emphasis on quality, service, AND value. How can I tell the difference between high quality and low quality teak and construction? Why does it matter? First, be sure you are purchasing 100% solid Grade A teak and not furniture made from Shorea wood or a combination of teak veneer and lesser quality woods that do not have the same longevity and reliability of high quality solid teak. Second, prior to construction, teak wood must be kiln dried (not air or sun dried) precisely to an optimal moisture content of 8 to 10% to ensure against later warping and splitting. Third, we recommend purchasing your teak from companies who utilize only 100% genuine plantation grown teak wood (which is reforested). Our teak comes from a long line of high quality teak plantations in Java, Indonesia, known for being of the highest quality in the world. Fourth, the presence of white (“young”) teak or knots, often masked by dark staining or heavy teak oil application, are hallmarks of inferior teak wood choice and not indicative of Grade A quality teak. Younger, lower quality wood, and knots significantly affect the stability and longevity of teak furniture and are never utilized in Colton Teak furniture or accessories. Fifth, the materials are only as good as the construction methods used to manufacture your furniture. At Colton Teak, we utilize the mortise & tenon joinery method buttressed by wood dowels & solid brass or stainless steel fittings, ensuring the strongest possible construction. Our teak is heavy-weight, with extra thick construction. Some companies offer “lighter” construction for less, but we do not recommend this for the longevity and enjoyment of your furniture and hence do not carry such a line. Finally, are you buying furniture designed with comfort and functionality in mind? Wide, ergonomic back and seat slats for chairs, benches & loungers make all the difference in the world. Tables that feature built-in umbrella holding bases will save you money and hassle, and expansion tables that feature a two leaf system, allowing the umbrella to stay in place at all times, enable the true flexibility for which expansion tables were meant. Will my furniture require much assembly? Wherever possible, we ship your furniture fully assembled (as noted in the item’s description where applicable) or sub-assembled. Sub-assembly means the item is being shipped with minimal assembly required, just enough to ensure safe & affordable shipping. For example, if the construction of a bench enables us to ship to you in four sections in a “flat box,” this results in much less damage than shipping fully assembled, keeps prices down for clients, and involves simply utilizing a hammer or mallot and the instructions given to assemble. Colton Teak never utilizes inexpensive, time consuming “assembly kits” -- no glue, sandpaper, or power drills are EVER needed! It should never take more than 20 minutes to completely assemble even our largest items. For questions regarding whether a particular item ships fully assembled or not, however, please see the item description or contact us directly for details. Moreover, should you prefer sub-assembled products to be fully assembled upon arrival, please contact us to arrange white glove shipping to your door, including set-up, for an additional fee. Can I really leave my teak outside through rain, snow & sleet? Absolutely. And there is no need for covers! Teak is the very best you can buy for outdoor use precisely because it is impervious to water damage, and will never rot. 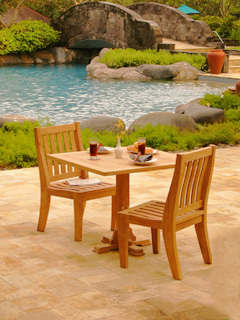 For more information on high quality teak and its amazing properties, see our About Teak section. How do I care for my teak? Based on our fantastic track record with commercial & private customers alike, we are so sure your love affair with our teak will begin at first site that we offer the most progressive 60 Day Money Back Guarantee and Lifetime Warranty policies in our industry. Click on either of these for more details. In the unlikely event of a return or exchange, it is very important to keep the packaging materials for the safe return of your furniture. Furniture must be returned in original condition (with the notable exception of shipping damage) for a full return or exchange. We begin processing your order from the time we receive payment and confirmation of order. As such, cancellations incur Colton Teak considerable merchant credit card fees, shipping, handling & restocking expenses that, in the interest of keeping our prices low, we do not build into our prices. Any cancellations of orders prior to shipping are subject to a 10% restocking fee to cover such expenses. Any cancellations of order after date of shipping are subject to all shipping charges that have been included in the purchase price. Do you offer discounts to the trade? Colton Teak provides an extremely generous discount program to the trade including those for custom & bulk orders. Customarily, Colton Teak provides a 7% discount for orders in excess of $5,000, 10% overall discount for orders in excess of $10,000, and a 15% overall discount for orders in excess of $20,000. As with smaller purchases, ground shipping is included in the purchase price, regardless of the size of your order unless rush or air shipping is required. For more information, please see our Commercial Orders section.